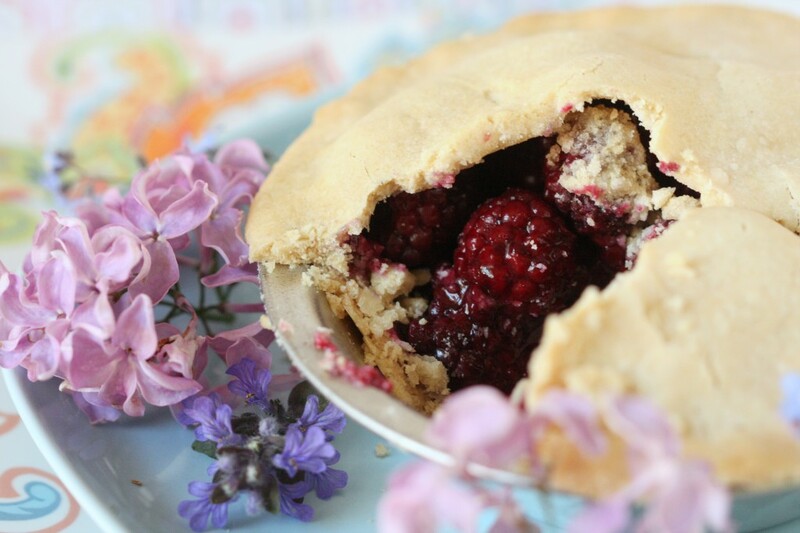 Pie Pie Pie… Its that glorious season for pie. I love pie. I love blueberry, strawberry, raspberry, apple, any pie. Now, for a gluten free person like me, making a pie crust without vegetable (soy) shortening, or butter, or any hydrogenated oils, or xanthan/guar gum, or eggs, much less gluten… presents a challenge. I wanted this pie crust to be real food only, allergy friendly. Oh, and it had to taste good. The pie crust below is perfect for mini-pies- I haven’t tried a big pie yet, but you’ll have to let me know if you try it- I would add 1 more tsp of agar powder for a big pie. My favorite way to cover the tops of pies is to make heart or star shaped cut outs from the dough and place them on top, so that the vents occur naturally. 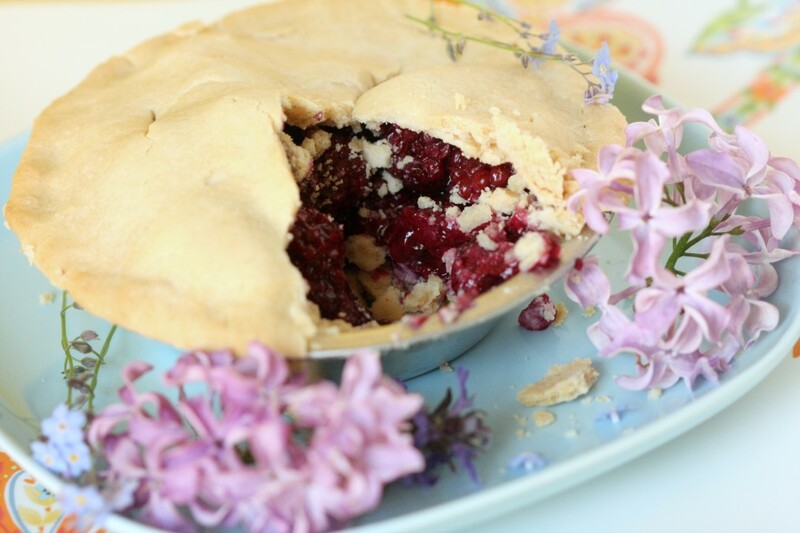 (See the Raspberry Pie for an idea). Want to do this with apples? Here’s an apple pie recipe for ideas. Aaaaalllrightey then. Lets get to making pie! 1- This recipe makes 3 mini- pies (about 5 inch diameter), or one regular sized pie. I haven’t tried it at the regular size yet. 2- To make this a blackberry pie, toss enough berries to fill the pie pan with enough tapioca starch to just gently coat them (I use about 1 tsp or so.) Put the berries inside the shell, and then drizzle over top your sweetener ( I like several generous tbsp of strong honey, but you can use: finely chopped 2-3 few dates tossed with the berries, plus 1/4 cup maple syrup or agave nectar, or you can toss the berries with 1/3 cup solid coconut sap. Also, blackberries can have a strong flavour, you may wish to toss them with some raspberries or blueberries to even it out. Mix the dry ingredients and sift them. Add the dry ingredients to a food processor, and spoonful by spoonful add in the solid oil. Blend until it gets to the consistency of crumbs. Drizzle in the cold water and cider vinegar, continue blending. When it’s a solid ball, remove. Separate in half, roll out to 1/4 – 1/8 inch thickness between two pieces of parchment paper. Peel off the top layer, and lay the dough inside the pie plate, peeling off the top piece of parchment slowly. The dough is delicate, so be careful. If it rips too easily, roll it out and then put it in the fridge for a few minutes to solidify. Fill with your preferred pie filling and bake until golden (see the note above for doing it with blackberries). IMPORTANT: If you use coconut oil, the pie will bake more quickly, and it will brown quickly, as the oil has a lower burning point. If you use unhydrogenated organic palm oil shortening, the crust will stay pretty light coloured and take longer to bake. I’ve heard of using a wash with melted coconut oil or other light oil and cinnamon… that would be yummy! oh thank you so much Miri!! You are speaking my language! My sweet 5 year old son is allergic to just about everything (gluten, all dairy, eggs, soy, peanuts, almonds, amaranth, garlic, lentils, oysters, and lettuce) & I haven’t found any decent recipies that are vegan (although we can use duck eggs every now & then when we can get our hands on them) for apple pies! 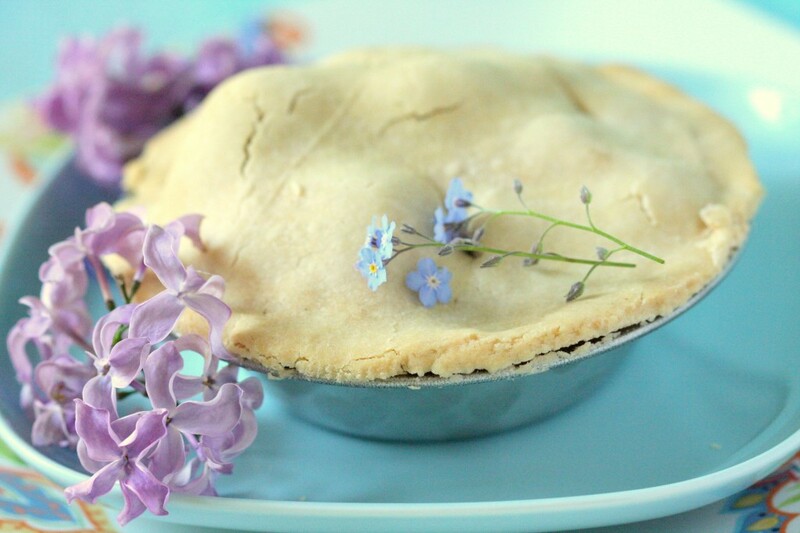 I am going to attempt my first every GLUTEN FREE & VEGAN apple pie tomorrow (today I am looking for recipies) and I have to say this looks like the best one I have found! Thank you for sharing! We can’t wait to eat fresh apple pie! hmm…- I think the palm oil is what helps hold it together better than the coconut oil- and i just noticed that using palm changes the cooking time (takes longer), so i’m wondering if it also changes the strength of the baking soda flavour too… Perhaps next batch, I’ll try it only with coconut oil to modify for a different baking experience. In the meantime, If you want to hange the texture, you can take out half the rice flour and substitute with sorghum flour (has a much lighter mouthfeel and crumb), reduce the bakingsoda (or increase the vinegar, whic h i suspect will make a big difference), and to help with binding, add in about 1 tbsp flax seed. I’m going to re-work the recipe and see how that turns out. In the meantime, if you do use animal products (but not eggs), I know that pork fat works nicely with the recipe too. I made a full pie-pan sized blueberry pie tonight using this recipe. It was nice, although the taste of baking soda was a bit too strong for me. I couldn’t find a suggested baking temp, so I went with 350F for about 45 minutes. I used coconut oil and I think maybe the recipe works better with palm shortening? This one I made with coconut oil was very crumbly/sandy. Thanks for all the new ideas in this recipe – I never would have thought of agar in a crust recipe! oh junia! yo uare so sweet… thank you so much… if you try it, let mek now how it goes :) ! WOW, this looks fabulous! i really want to explore gluten free baking even more now. i’m bookmarking this!